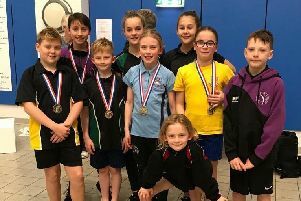 Eight of Dunstable SC’s performance and sprint swimmers competed at this years’ Winter Regional Championships held at Inspire in Luton earlier this month. DSC had Michael Judd, Walter Hackett, Ollie Ellison and Jamie Hose in action for the boys, with Jessica Kefford, Millie Dudley, Ruby Collins and Maia Morgan going for the girls. Hackett, 15, produced some astonishing swims for his age, equalling his 50m freestyle PB with 25.44 to come fifth overall. He then clocked a blistering PB of 1.10.25 in the 100m breaststroke for another fifth place and 59.90 for the 100m backstroke. This was followed by a best of 27.2 in the 50m backstroke which propelled him into the final, where he managed 27.25 putting for sixth place overall in the region. In the 100m IM he swam a PB of 1.03.01 for fourth spot in his age group, with another big PB of 56.06 following in the 100m freestyle, before a best of 2.09.4 and a Winters National time in the 200m backstroke. There were new club records were taken in 50m, 100m and 200m backstroke, plus the 100m breaststroke and 100m IM. Judd, 20, gave some amazing performances over the weekend as he started with the gruelling 200m IM and produced a gutsy swim of 2.18.23. His 50m freestyle was just outside PB, but still a brilliant 25.99, while he also swam a new PB in the 50m backstroke of 28.26. Judd then managed to go in the 100m backstroke (1.00.28), 100m IM (1.02.52), 50m breaststroke (31.65) and 200m backstroke (2.09.53). Kefford, 14, had an amazing clean sweep of PBs in all her three backstroke distances, after not managing a new best since January. She pulled out a brilliant 32.07 in the 50m, while then clocking 1.07.98 in the 100m and 2.28.91 in the 200m to win her heat. Ellison, 15, swam 26.53 for the 50m freestyle and 30.91 for the 50m backstroke, while Hose, 19, who has moved to university and is training out of the UEA pool in Norwich, timed a huge PB of 2.27.24 in the 200m butterfly. Collins, 14, made her Winter Regional Championships debut in the 50m freestyle, recording 29.19, while Morgan, 15, bagged a PB and club record of 36.53 in the 50m breaststroke. Dudley, 13, was right on pace for her 100m IM in 1.11.94, while the 50m butterfly saw her produce a fantastic short course PB of 30.93, plus another PB of 29.53 in the 50m freestyle. Tim Hutton, the Dunstable SC director of swimming, said: “It was a great Champs for DSC over a year into our extensive refurb, with personal best swims galore from all of our participants.